Are you looking for a high level cleaning company within Milton Keynes? You have come to the right place. DMC facilities management LTD are fully qualified cleaning specialists. We ensure that the task at hand is done at the highest possible level, giving our customers 100% satisfaction. 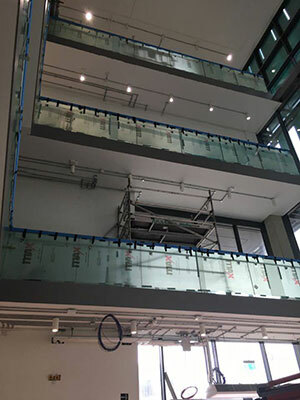 We offer a wide range of services from cladding cleaning, window cleaning, office cleaning, roof cleaning and much more to ensure that you receive the ultimate solution. At DMC we will work with you to create a tailored made service that can meet your needs with in an affordable price. We will always visit your premises to ensure we have taken in to consideration all your cleaning needs and any areas that are hard to reach, giving a more accurate quote for the task needed. Our specialists will send you a dedicated team to provide high level cleaning in Milton Keynes; our team are fully trained and well equipped for the job at hand. At DMC we use the latest equipment and machinery, which are designed for the different services we offer. As high level cleaning specialists we insure that we follow the most up to date health and safety standards, making sure all risk assessments and method statements are completed before carrying out any level of cleaning. We like to improve our procedures and services by constantly monitoring, reviewing and improving, to reduce and prevent any possible hazards that may occur, allowing our team to work safety and effectively. Get your tailored made high level cleaning quote today for the Milton Keynes area or if you have any questions please do not hesitate to contact us today to speak with one of our specialists on 01525 500 100.